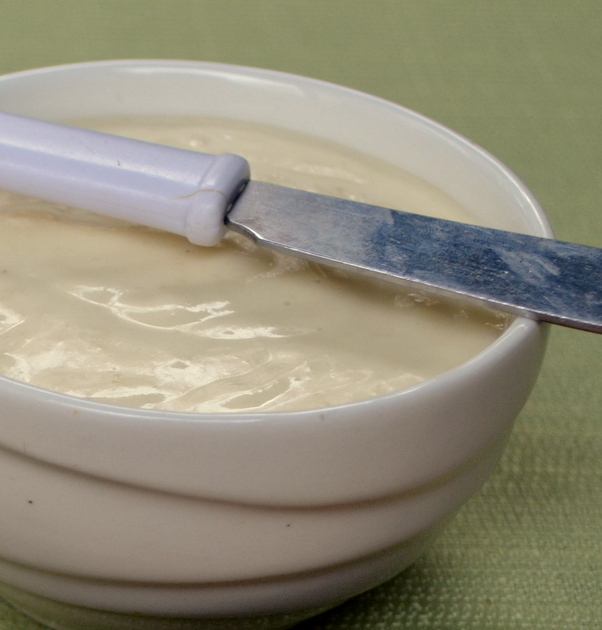 I love the mellow flavour of roasted garlic in this aioli. The roasted garlic aioli makes a great dip with fresh veggies or, it can be slathered on the bun when making turkey sliders or ground sirloin burgers. I often perk up a tuna melt or egg salad by substituting roasted garlic aioli for regular mayonnaise. No doubt you will find your own uses for this versatile sauce! Read the Quick Tip below for an easier and less time consuming version of this yummy roasted garlic aioli. 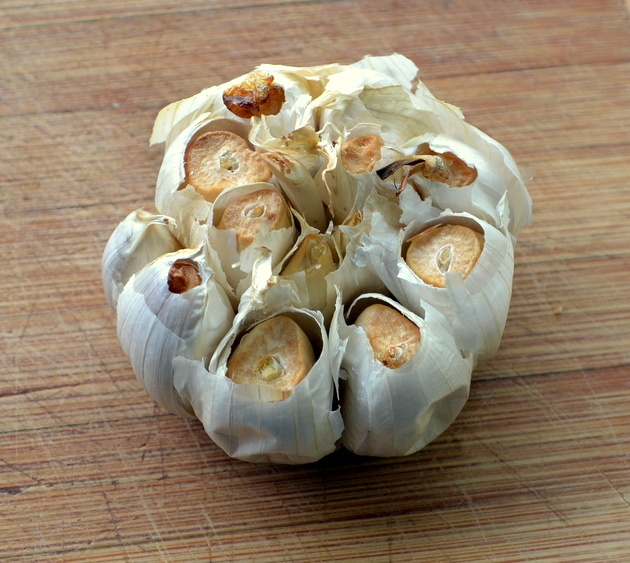 Brush off any loose bits of the paper-like outer coating of the whole garlic bulb. Cut the top off the whole bulb. Place the bulb on a piece of aluminum foil 6” x 6” square and drizzle 1 T olive oil down into the bulb so the oil surrounds the individual garlic cloves in the bulb. Wrap the foil around the garlic bulb, put the foil packet on a cookie sheet and place on the middle rack of the preheated oven. Bake on the middle rack of the oven for 25 minutes. Remove from the oven and open up the foil packet to let the garlic bulb cool. When you can handle it easily, separate into individual cloves and then squeeze the cloves out of their paper-like covers into a small bowl. Season with a pinch of salt and mash into a paste with the back of a metal table spoon. Set aside. Place egg yolk in the blender container with the lemon juice and Dijon mustard. Process on high speed while slowly drizzling the oil through the opening in the top of the blender cover. The oil will blend with the yolk mixture and will emulsify as you slowly drizzle it, drop by drop into the blender. You can tell the oil is emulsifying as it will turn the yolk mixture an opaque whitish colour (just like mayonnaise). Take your time with this process … it can’t be rushed! When all the oil has been incorporated into the aioli stop the blender and add the mashed garlic. Process on a high speed until the roasted garlic is completely blended into the aioli sauce. Yield: ¾ cup Quick Tip If you are in a hurry you can do steps 1 through 3 and then simply combine the mashed roasted garlic with 2/3 cup of prepared mayonnaise and 1 tsp of Dijon mustard. This makes a fine version of roasted garlic aioli. If you want the sauce to be a bit thinner, just add 1 or 2 T of milk and mix well.